On Thursday, April 19, a woman and her family brought in their puppy that was having seizures. 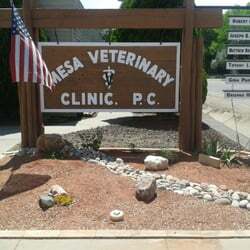 The staff at Mesa Veterinary Clinic went to work on determining a diagnosis. The dog was determined rabies positive after getting tested. Current practice manager and certified technician at Mesa Vet, Monica Harvey, explained, “It is possible for puppies to sometimes get seizures because they are so little.” They have high metabolisms and that can cause their blood sugar to drop. If their blood sugar levels drop too low, it can cause neurological complications, like seizures. In this case, the puppies blood glucose levels were normal and he was unresponsive to seizure medication. If he was suffering from just the seizures, he glucose levels may have been lowered. His lack to react to the medicine led the doctors to decide to euthanize the dog, because he was not getting any better. One of the symptoms of rabies is seizures. By following protocol, the clinic had to send the dog to the Health Department to determine if it was positive for the disease. The last positive domestic rabies case in Pueblo County was about 60 years ago, and this case breaks that streak. The biggest concern now is that rabies is zoonotic disease, meaning it can spread in between animals and people. At first, the woman claimed to have gotten the dog from an add online. It was later confirmed that they woman and her family lived downtown in Pueblo. It is hard to know how many people and other animals came in contact with the dog. Rabies is most commonly spread by the saliva from the infected animal. If someone has even a small paper-cut and they licked by the dog, they become at risk for contracting the disease. Because of this, one doctor and two technicians were sent to the emergency room for vaccinations. Newest reports have stated that the family had another dog but are refusing to euthanize it, despite it being unvaccinated and highly at risk for also getting rabies. The Pueblo Department of Public Health and Environment and Animal Control are increasing efforts to find the dog to quarantine it. The family, however, is noncooperative with authorities. Mesa Veterinary Clinic offers rabies vaccinations for $12. Owners can sign a form to not even have to pay for an exam, just strictly for the vaccine. Walk-in appointments are welcome. See more on their website. The Southern Colorado Spay and Neuter Clinic offers the same service. This inexpensive vaccine guarantees a year of protection from the disease. There is more information on their website.